Giacomo and his wife Gianna live in the Italian port city of Livorno , the Mediterranean gateway to Florence and Tuscany. They started Livorno Daily Photo on Christmas week of 2008 and have posted continuously ever since. Giacomo felt he needed a pen name, so he chose “VP” as “Vogon Poet” in honor of the Vogon poetry, the third worst in the universe according to “The Hitchhiker’s Guide to the Galaxy”. Gianna chose Trillian, another character from the same series of books. VP rode a bicycle as a kid, sometimes for pleasure and often as a means of transportation. Now Trillian and VP mostly walk, but they are still fascinated by locked or abandoned bikes they see around. They are one of their favorite subjects and they also invented a kind of art about them. There many bicycles around Livorno, probably too many and a lot of them abandoned and/or damaged. 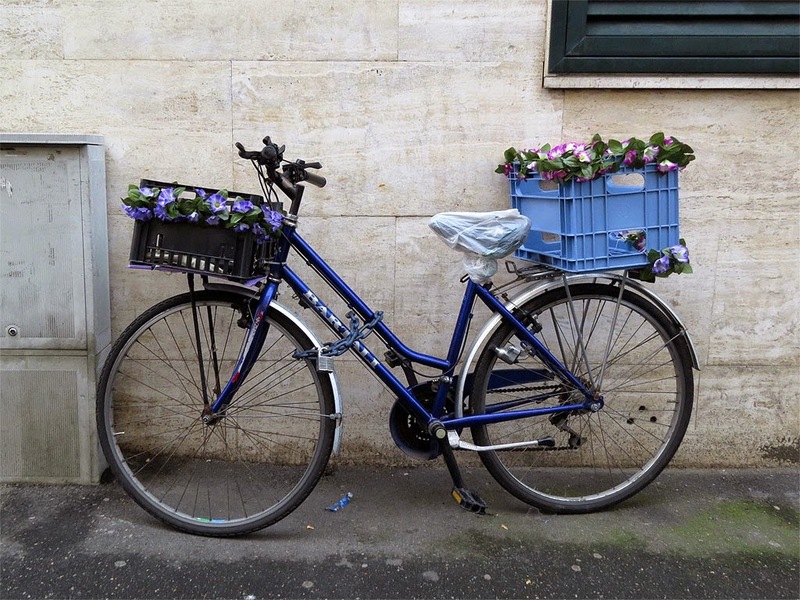 This kind of bicycle, with baskets and floral decorations, is quite nice and relatively common here. I suspect this will be a most popular theme, Peter. Once again, many thanks for hosting.